You want some spaghetti, but don’t want to drag out the large pots for boiling water and for cooking the sauce. You want to make a smaller amount. You’re not in the mood to stand at the stove for a long time. And you want it to taste good. This is the perfect time to make a small batch of Instant Pot Mini – Spaghetti. In this continuing “Mini Series” I give you a tasty and easy recipe for spaghetti in the 3 quart electric pressure cooker. If Paul goes out of town, I’m cooking for one. I don’t mind having leftovers, but my normal pot of spaghetti that I have made for years yields enough to feed 10 people! That’s a bit too much. The 3 quart Instant Pot pressure cooker is the perfect size for making spaghetti for one or two servings. 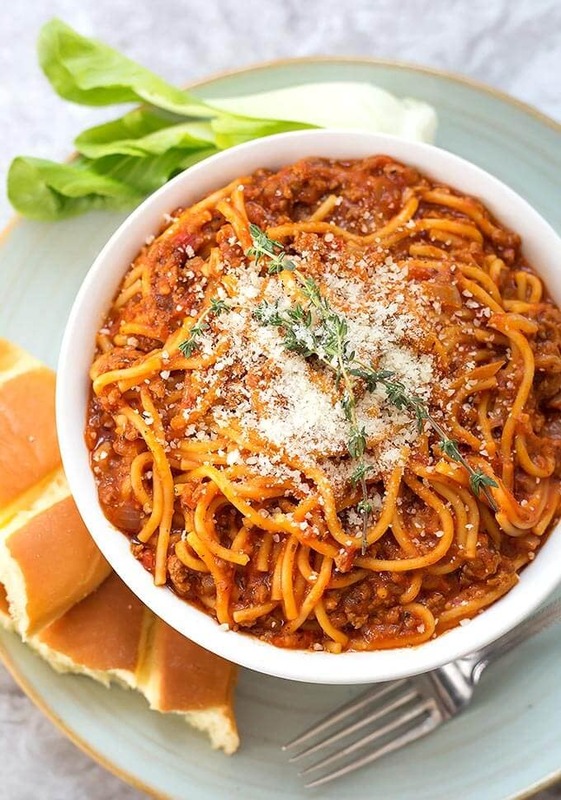 This Instant Pot Mini – Spaghetti recipe yields 3 cups, so that’s two servings for me. I like to use marinara if I’m using jarred sauce, as I can spice it up to my liking. If you have a favorite jarred sauce, then just add in the onion and garlic as written in this recipe. It will enhance the flavor of the sauce nicely. I have had great results with this recipe delivering noodles that don’t stick together. It’s all in how you put them in the sauce. Break them in thirds, then you have to arrange them in a random pattern, changing directions so they don’t all lay with their sides touching. Then just push them down into the sauce without stirring it. Just make sure they get submerged. When they are done just stir them up! 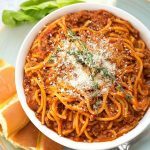 Instant Pot Mini - Spaghetti is a quick and tasty spaghetti made in your 3 quart electric pressure cooker. Makes 3 cups. Turn on the Sauté function (Normal/Med heat). When the display reads “Hot” add the meat. Cook, stirring occasionally, until almost done. If using ground turkey you may need to add a little oil first. Add the onion, cook, stirring occasionally, until onion starts to turn translucent. Add spaghetti sauce and water. Stir. Sprinkle on the noodles in a criss cross pattern, varying the placement so not all of them are laying side by side. This is to minimize them sticking together. Use a spoon to gently press them down into the sauce. Try to get them all in the sauce, but do not stir it. Place the lid on the pressure cooker and lock it into place. Set the steam release knob to Sealing. Press the Pressure Cook (Manual) button and then the + or - button to choose 9 minutes. When the cook cycle is finished, let the pot sit and naturally release pressure for 5 minutes (I use a heartier pasta, if you don't, then do a Quick Release}. Then manually release the remaining pressure by turning the steam release knob to Venting. When the pin in the lid drops, it is safe to open the lid. Open and stir the spaghetti. Separate any noodles that may have stuck together. Taste and adjust salt, if needed. Stir in the parmesan cheese and serve with any garnish you like. *Depending on how seasoned your spaghetti sauce is, you might want to consider adding extra spices. I use marinara sauce, so I have to add spices. I like Italian seasoning, oregano, and a bay leaf. Could this recipe be made in a 6 quart pot? I like the smaller quantity but I have a standard size Instant Pot. Thank you. Hi Judy! I have only tested this in the 3 quart. I think it has enough water that you could, in theory, make this in the 5 or 6 quart. Not the 8 quart without more liquid. I would just try a batch. Thanks, I am going to try this after I make hard boiled eggs first. I have the instant pot mini. Hi Colleen! I hope you love it! We sure do! Are you sure 4oz of pasta is correct? That is not very much. Thank you! Hi Jacque, yes, I’m sure. This is a recipe for the smaller, 3 quart Mini Instant Pot (for those who want to make smaller amounts). It is half of the normal recipe. Just double it (but keep the same cook time) for a full batch. Thank you for your question. Could I make double in the mini? Have you ever tried that? Hi Betsy, I haven’t tried making a double batch in the Mini as I also have a 6 qt and would use that. If you try it, make sure you are doing a controlled quick release as the pot will be fuller and more risk of sauce spewing out of the vent. Go slowly, in bursts until you feel certain that the coast is clear! Can you make this with frozen spaghetti sauce, or would you have to defrost the sauce first? Thanks! Hi Harleen, you would want to defrost it first as the sauce is part of what cooks the pasta and makes it soft. I made this recipe for dinner and it turned out perfect. This was my first attempt at using the mini instant pot. Hi Jane! That’s so great! Thank you for letting me know! Look for more Mini recipes coming soon! Hi Peggy, yes, as a general rule you can. The cook times will remain the same, unless the cut of meat is thicker/thinner, etc. If you ever have a question about halving one of the recipes, please ask! I made this recipe with fake meat crumbles. Nothing fancy, I mainly wanted to make sure that the texture of the pasta would be correct. It was great! Next time I can doctor it up with mushrooms, etc. That’s great, Vada. I really like pasta done in the IP. Glad you enjoyed it. Thank you for your review! Hi Kim. yes, I do think they would overcook. You could try thin spaghetti, which is in between spaghetti and angel hair. Reduce the cook time by a minute or two. When I use vermicelli, usually in a soup, I add it after pressure cooking. Then I just simmer it for a few minutes, stirring occasionally, until it is soft. what about a smaller type pasta like penne or bowtie? would the cook times need to be adjusted? The rule of thumb with pasta is to cook it for half of the time the package directions say to. So if the package calls for 9 minutes, do 4 minutes for more al dente, and 5 minutes for softer pasta. Thank you for the info on converting recipes for 6 quart to 3 quart mini. Because many recipes cannot be halved without adjusting the temperature, the times, or the ratio of spices or other ingredients. The info that came with the mini said nothing about converting recipes. I was not only disappointed but angry that I spent so much on an appliance and the company couldn’t bother to provide some recipes for guaranteed success and info on conversion. I contacted the company with no response from them. Thanks again. Hi Candace, I hear you. I’m still working on more 3 qt recipes, so please check back. If you ever have a question, please ask! Take care. Purchased my Instant Pot Mini last week and tried your spaghetti recipe. It was delicious. Looking forward to trying more of your recipes. Hi Cathy! I’m happy you liked the spaghetti! Thank you for your review! Can I do this with meatballs? Yes, just have them on the bottom. I look forward to trying this recipe w/o meat and using GF pasta. Would the pressure cook or steam release time change? Thanks! Hi Margaret, the only things that will change are the cook time for not frying meat (but you still cook the onion), and the GF pasta cook time. Every pasta is different. Usually half the recommended cook time, or a minute less. It depends on what it is made out of, rice, corn, etc. I have the Lux mini, not Duo, so am glad to have recipes for it.Thank you! I am going to make the spaghetti!! Love to have more of your recipes for it!! That’s great, Martha! I hope you like them. Many of my other recipes can be cut in half to accommodate the 3 qt size. Can I make this recipe without using the pasta in the instapot ? You mean just the sauce? That’s great, Evan! Thank you for your review! What is the tip about the clip. A metal binder clip will hold the pot in place as you stir. Hi, can I use 1lb ofbeef instead of half? PERFECTION! Thank you for the instructions. The time and ratios worked oh, so well! I used my own seasonings. I can’t wait to try out more recipes especially suited to the mini! That’s great, Kristin! Thank you for your review! Just made this recipe tonight. Best IP Mini Spaghetti recipe I’ve tried yet ! This one is a keeper. Thanks ! i bought my pot over a week ago and haven’t tried anything yet. I am in a long term facility with my husband until about 7 every night so I’m always too tired to cook when I come home. 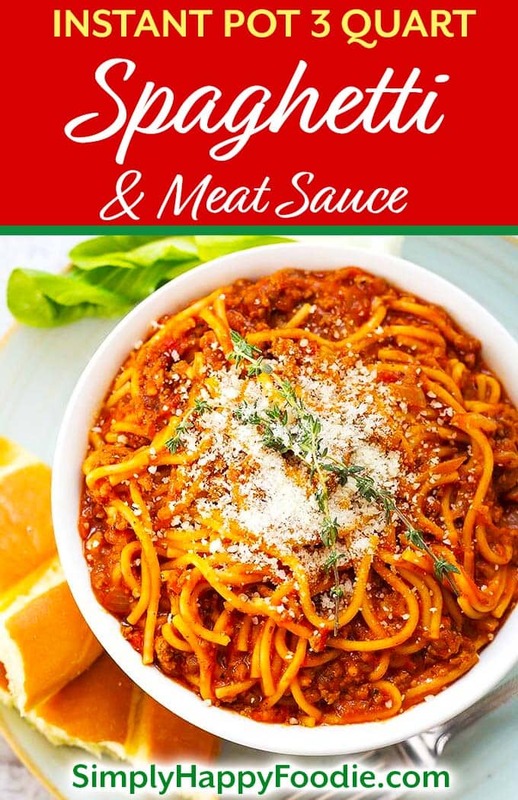 Could I prepare the meat then add all the other ingredients around 12-1 pm and set the pot on a timer for this spaghetti recipe? I think you could. I haven’t tried it with spaghetti. And since it needs a Quick Release of pressure so the pasta doesn’t overcook, I would set the cook time to be a few minutes less. It would be a good experiment.